TRENTON, N.J. (AP) — The biggest U.S.-based drugmaker will change leaders in January when Pfizer Chief Operating Officer Albert Bourla replaces CEO Ian Read, who has led the company for nearly eight years. Pfizer Inc. said Monday that Read will become executive chairman of Pfizer’s board of directors. The move comes after Pfizer’s board in March gave Read an $8 million bonus contingent on boosting Pfizer’s stock price and staying on for up to a year. That allowed Read time to groom Bourla, who had been appointed last January to the newly created chief operating officer post. The maker of Viagra and the advanced breast cancer drug Ibrance has been dealing for several years with declining revenue as patents expired and generic competition began for a series of big-selling drugs, as have many other drugmakers. For Pfizer, those drugs include Viagra, blood pressure pill Norvasc and high-cholesterol pill Lipitor, which had reigned as the world’s top-selling drug for nearly a decade. The success of Ibrance, other recent cancer drugs and pneumococcal vaccine Prevnar 13 have revenue growing again, and Pfizer shares have risen about 22 percent so far this year. Read, who started working at Pfizer in 1978 as an auditor, spent much of his tenure as CEO trying to pull off mega-acquisitions, the strategy that had enabled Pfizer to leapfrog to the top among U.S. drugmakers. But Read failed on deals to acquire first Allergan and then AstraZeneca, primarily to be able to move Pfizer’s headquarters — just on paper — to lower-tax countries in Europe. The New York company said in July that it was again reshaping its business, this time into three units: Innovative Medicines; Established Medicines, which handles older drugs that have lost protection; and Consumer Healthcare. It said Innovative Medicines will bring in most of the company’s revenue and has strong growth potential, due partially to an aging population that will create growing demand for new medicines. A couple of weeks after announcing the business reorganization, Pfizer reported a second-quarter profit that surged 26 percent in a performance that beat Wall Street expectations. But Pfizer drew the ire of President Donald Trump in early July when it announced price hikes for about 40 of its drugs — shortly after Trump promised without any grounds that drug companies would be announcing “massive” voluntary price cuts by mid-June. Those cuts never came and most drugmakers have continued to hike prices, but Trump publicly shamed Pfizer on Twitter for its increases, leading the company to reverse them, but only until January at the latest. The 56-year-old Bourla just became chief operating officer in January. He also has run the drugmaker’s vaccines, oncology and consumer health care business. Read, 65, became CEO in December 2010 and has served as board chairman since 2011. 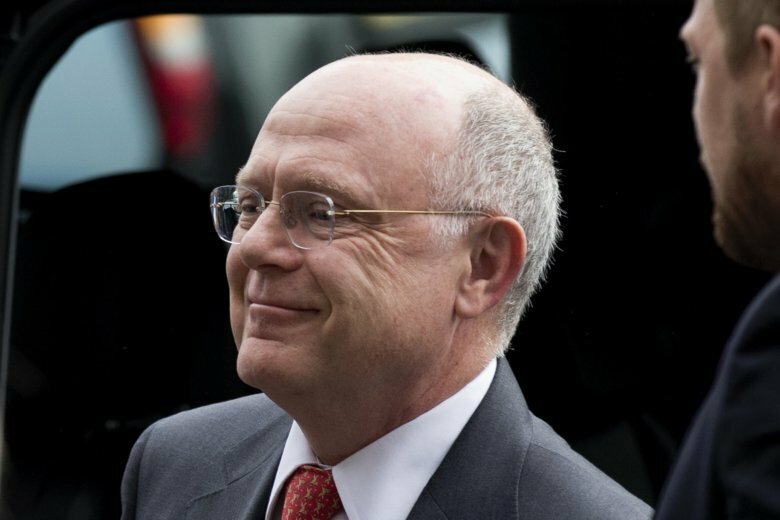 When he took over, Pfizer’s share price was just $16.72, after steadily declining by more than one-third during the 4 ½-year tenure of his predecessor, Jeffrey Kindler — a key reason Pfizer’s board forced Kindler out suddenly. On Monday, Pfizer shares climbed 20 cents to $44.27. Johnson, based in Trenton, covers the pharmaceutical industry. Murphy reported from Indianapolis.